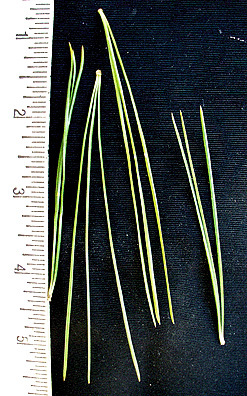 Leaf:Evergreen needles, 2 1/2 to 4 1/2 inches long, in fascicles of 3, stout, fascicle sheath sheds in first year, blue-green with white stomatal bands. 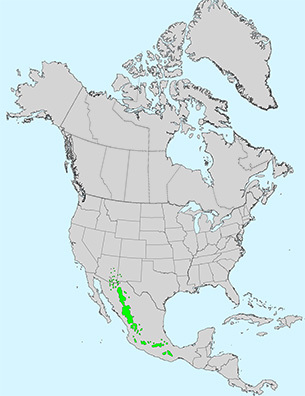 Flower:Species is monoecious; males purple than turning yellow, in clusters at branch tips; females red, at branch tips, appearing in spring. 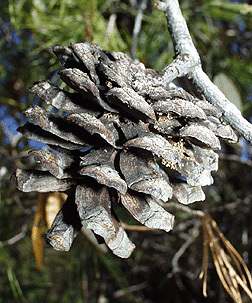 Fruit:Woody cone, 1 1/2 to 2 1/2 inches long and nearly as wide, dark reddish to gray-brown with a long stalk, slight prickle on scale, requires 3 years to mature and persist on the tree for many years. 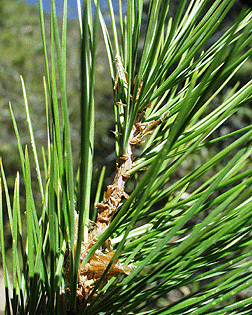 Twig:Moderately stout, reddish brown, narrow pointed buds. 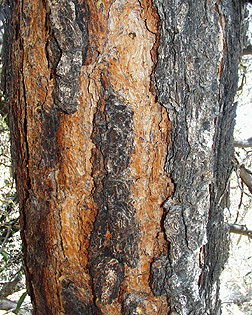 Bark:Very dark (nearly black), thick, coarse ridges, lighter reddish brown, deep vertical fissures. 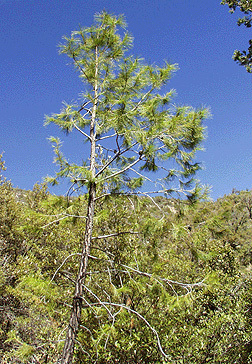 Form:A small tree reaching up to 50 feet tall and 2 feet in diameter, open crown with upturned branches.